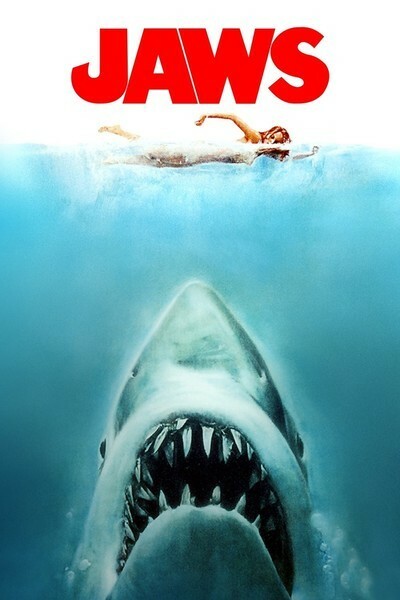 Steven Spielberg's "Jaws" is a sensationally effective action picture, a scary thriller that works all the better because it's populated with characters that have been developed into human beings we get to know and care about. It's a film that's as frightening as "The Exorcist," and yet it's a nicer kind of fright, somehow more fun because we're being scared by an outdoor-adventure saga instead of by a brimstone-and-vomit devil. The story, as I guess everyone knows by now, involves a series of attacks on swimmers by a great white shark, the response of the threatened resort island to its loss of tourist business, and, finally, the epic attempt by three men to track the shark and kill it. There are no doubt supposed to be all sorts of levels of meanings in such an archetypal story, but Spielberg wisely decides not to underline any of them. This is an action film content to stay entirely within the perimeters of its story, and none of the characters has to wade through speeches expounding on the significance of it all. Spielberg is very good, though, at presenting those characters in a way that makes them individuals. Before the three men get on that leaky old boat and go forth to do battle with what amounts to an elemental natural force, we know them well enough to be genuinely interested in the ways they'll respond. There's Brody (Roy Scheider), the police chief, who came to the island from New York looking, so he thought, for a change from the fears of the city. There's Quint (Robert Shaw), a caricature of the crusty old seafaring salt, who has a very particular personal reason for hating sharks. And there's Hooper (Richard Dreyfuss), the rich kid turned oceanographer, who knows best of all what a shark can do to a man, and yet is willing to get into the water with one. All three performances are really fine. Scheider is the character most of us identify with. He's actually scared of the water, doesn't like to swim and, when he sees the giant shark swim past the boat for the first time, we believe him when he informs Quint, very sincerely, "We need a bigger boat." Shaw brings a degree of cheerful exaggeration to his role as Quint, stomping around like a cross between Captain Queeg and Captain Hook, and then delivering a compelling five-minute monologue about the time the Indianapolis went down and he was one of more than a thousand men in the water. By the time rescue came, two-thirds of them had been killed by sharks. Probably the most inspired piece of casting in the movie is the use of Richard Dreyfuss as the oceanographer. He made this film soon after playing the driven, scheming, overwhelmingly ambitious title character in "The Apprenticeship of Duddy Kravitz," and the nice kid, college-bound, in "American Graffiti." Here he looks properly young, engaging, and scholarly, and introduces the technical material about sharks in a way that reinforces our elemental fear of them. Which brings us to the shark itself. Some of the footage in the film is of an actual great white shark. The rest uses a mechanical shark patterned on the real thing. The illusion is complete. We see the shark close up, we look in its relentless eye, and it just plain feels like a shark. "Jaws" is a great adventure movie of the kind we don't get very often any more. It's clean-cut adventure, without the gratuitous violence of so many action pictures. It has the necessary amount of blood and guts to work -- but none extra. And it's one hell of a good story, brilliantly told.